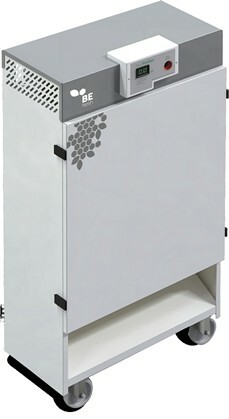 "First machine able to assess ethylene elimination efficiency in real time"
In this year's edition of Fruit Logistica Berlin 2019, BEfresh Technology is launching a machine with cutting-edge technology for the elimination of ethylene gas in cold rooms for the storage of fruits, vegetables and ornamentals. "This is the first machine on the market capable of real-time assessment of ethylene elimination efficiency, incorporating the BEfresh modules," explains Marc Benarie, Export Manager of BEfresh. "These filters contain the BEfresh+ granulate, a material extruded in our factory, based on natural clays and potassium permanganate, which guarantees the highest absorption capacity in the market," he says. Food Fresher is the first machine that incorporates an alarm system that actually shows when the granulate's capacity has been exhausted. "With its patented technology, BEfresh guarantees that the filters will be replaced at the right time, ensuring that perishable products won't suffer the impact of ethylene. Food Fresher guarantees the granulate's top performance in controlling the efficiency of the filters. With this technology, the decision to replace the granulate is not based on theoretical estimates, which may result in economic losses due to either it being carried out too early, or worse, too late, causing the deterioration in the quality of the fresh products. The state-of-the-art Food Fresher machine guarantees a high efficiency, autonomy and easy maintenance," says Marc Benarie. Come and learn more about our new breakthrough at Fruit Logistica Berlin, at the BEfresh Technology stand, Hall 26 D-13.